With nearly 40 years of professional financial planning experience, Paul Byron Hill is CEO and president of Professional Financial Strategies, Inc. outside of Rochester, New York which he founded in 1993. He also serves as the firm’s senior wealth management professional. Mr. Hill acts as a personal chief financial officer for affluent and aspiring clients, working with a team of outside experts, bringing together a distinctive wealth management process focused on clients’ individual needs, values and goals to make well-informed decisions for investing wealth, mitigating taxes, protecting assets, passing a secure legacy, and benefiting charitable causes. Prior to establishing his pioneering independent financial and wealth planning firm, Mr. Hill was principal of Hill Financial Advisors from 1984 to 1994, working in the insurance industry before that. His disappointment with that industry’s sales incentives motivated Mr. Hill to earn his professional designations: Certified Financial Planner (CFP®), Chartered Financial Consultant, and later, Accredited Tax Advisor. These have ethical requirements and fiduciary duties of loyalty and care. He is a member of the Financial Planning Association and the National Society of Accountants and is licensed to teach continuing education for CPAs. Mr. Hill served as an adjunct faculty member for the College for Financial Planning at St. John Fisher College in Pittsford, New York. During his career Mr. Hill has been recognized for his contributions. Reuters named him among the Top Advisors in the U.S. for 2008, and featured him on their Advice Point website. He and his firm have been written about in Forbes, Fortune, and Money, among others. Likewise, he was interviewed by Dimensional Fund Advisors for their “Value an Advisor” series. 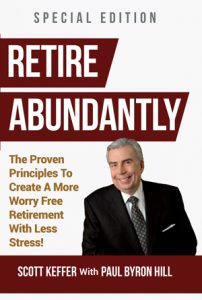 As co-author of the book Retire Abundantly, James Malinchak of ABC-TV’s “The Secret Millionaire” also interviewed him. Additionally, Mr. Hill is a consultant and financial supporter for the Partnership Foundation for advancing education in tribal areas of northeastern India.